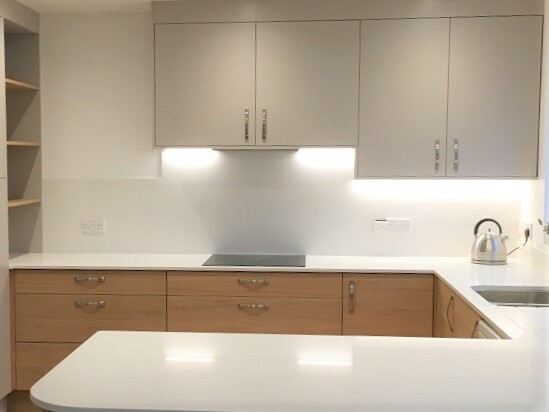 Our customer had a very sleek modern style kitchen and wanted a discreet extractor built into a cabinet, whilst retaining as much storage space as possible. Doug custom built a reinforced 1.2m wide cabinet to incorporate this canopy extractor. A structural boxing was built around the extractor duct, and used to support full-width shelving, maximising the usable space within. LED lighting was recessed into panels lining the underside of the cabinet, to be used in addition to the extractor lighting.